The rotifer is an extremely fascinating creature, mainly due to its wheel-like head, which also also earns it the name of “wheel animal”. 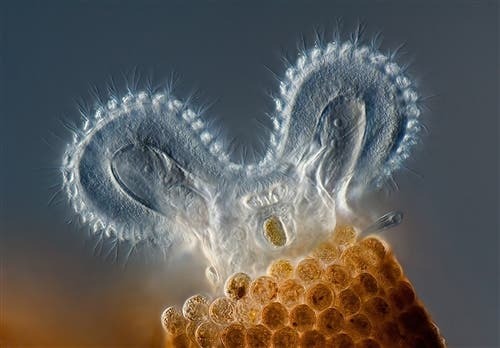 A microphoto of a rotifer, which can be seen depicted above, earned the photographer, Charles Krebs, the first prize in the 2011 Olympus BioScapes Digital Imaging Competition. Rotifers are only 0.1–0.5 mm long, and are commonly found in freshwater environments. What makes this animal unique, however, is its “ears” – the corona around the mouth that in motion resembles a wheel. The corona does actually rotate, instead tiny hairs on its surface, called cilia, sweep at high velocity directing nutrients in the water towards the rotifer’s mouth. Kebs, who’s been focusing on microphotography since 2004, and is a proemienent figure in the niche, captured the photo in this story in a pond, near his house in Washington.